Jolly Old Soles, www.jollyoldsoles.com, is dedicated to providing new and used shoes to primarily local organizations that assist both children and adults in need. Jolly Old Soles’ purpose is to connect those willing to help with those needing assistance with one of our basic human necessities, shoes. As of 10/30/2011 1290 pairs of shoes have been collected and 859 pairs have been donated. Jolly Old Soles was created by Dr. Phyllis Parise, a working mother who wanted to make a difference and Pay It Forward. Our mission is to collect and house new and used shoes donated via the generosity of our community and distribute them to those in need. Jolly Old Soles is a 501 (C) (3) public charity. All donations are tax deductible. Donation have gone toFamily Shelter Service of DuPage County, Families Helping Families, Hesed House. Wayside Cross Ministries, Bridge Communities, Diocese of Joliet, Pangea Educational Development,Kathy J Weinman Advocacy Center St. Louis, MO, Green Lake County Wisconsin Health & Human Services - Economic Support Unit, MIFA- Metropolitan Inter-Faith Association Memphis, TN, Hands of Hope at Community Christian Church, The Children of the Dominican Republic and The Children of the Pine Ridge Indian Reservation in South Dakota. Gift cards to Payless Shoes Stores, DSW, Shoe Carnival, WalMart, Target, Meijer or any other store selling shoes and shoe supplies and cash donations! Thanks Laurie Knoll for your incredible article in the Babbling Brook, p. 14. Jolly Old Soles makes the Chicago Tribune and the Naperville Triblocal. Thanks Suzanne! Phyllis Parise likes to help people. But helping people and talking about it are two very different things. "Some people talk a good game but they don't do a thing," said Parise, founder of Jolly Old Soles, a charity that donates shoes to those in need. "I have always been involved in charities and thought I needed to do something more, so I figured, 'Everyone needs shoes. Why not donate shoes?' My basement is now a shoe palace." Parise -- shown above at left with her daughter, Morgan -- has collected nearly 1,200 pair of shoes and donated 900 since launching Jolly Old Soles in December 2010. "I hear about a charity or a community that is falling on hard times, and I make a call, and ask when I can come and drop off some shoes," she said. "Right now, I have about 200 pair I'm going to give to an American Indian reservation in Manderson, S.D. If I can't get someone to donate the shipping, I'll just drive them there myself." Parise, a single parent who teaches at Lewis University's college of business when she's not running Jolly Old Soles, said there's no excuse for not giving back. "There's always someone who has it worse than you," she said. "Not that I don't have problems too—but I think people need to do more to help out. Everyone has a pair of shoes they'd don't use anymore in their closet. Why not give them to someone who will be happy to have them?" Jolly Old Soles will be taking donations at their "Kick-Off" party on Nov. 19 in Naperville. For more information, visit http://www.jollyoldsoles.com. Phyllis Parise recently appeared at a Fox Valley sustainability event promoting donations to Jolly Old Soles. (Photo by Jack McCarthy / Chronicle Media). When Dr. Phyllis Parise and Kathy Ruggio served as tutors at an Aurora school, they quickly realized that some of their students did not have shoes or clothes that fit properly. It was very hard accept that students at this school were lacking basic needs. “The students had shoes that didn’t fit them right or clothes that were stained or too small.” , said Ruggio, a Wheaton resident. Parise, who lives in Naperville, started bringing her daughter’s outgrown clothes, shoes and new school supplies to share with the children. With a long history of volunteering, Parise — also a college professor — decided to go one step further in an effort to help more people. 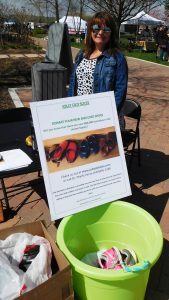 In 2010, she formed Jolly Old Soles, a non-profit organization dedicated to collecting new and used shoes and redistributing them to needy individuals. Parise said she decided to focus on footwear, figuring that it is something people always need. Shoes are also something everyone can donate, she added. Today, Ruggio and Parise’s daughter, Morgan Parise, who often joined her mother on her other volunteer efforts, both serve as board members of Jolly Old Soles. The organization’s name was especially meaningful, because it is dedicated to giving another life to shoes, Ruggio said. To date, the organization collected nearly 8,500 shoes. Of that number, 7,387 pairs have been redistributed to needy individuals both nearby and in other states and countries. “We try to meet the needs of organizations who call with a specific request for a certain type of shoe in a specific size,” Morgan Parise said. Shoes have been redistributed to local organizations like Hesed House, Wayside Cross Ministries and Bridge Communities. Shoes also have been sent to children living on a South Dakota Native American reservations and nonprofits in other states such as Wisconsin, Tennessee, Missouri and Virginia. Some shoes even reached children in the Dominican Republic. Despite Jolly Old Soles’ large geographical reach of her organization, it is still looking for new nonprofits in need of shoes. and organizes the shoes which are stored in the basement of her family’s Naperville home. Graduating with a degree in elementary education from Eastern Illinois University, Parise also has taken shoes collected by her mother’s organization and distributed them to needy school children in the Charleston area. Students in need of volunteer hours also have come to the Parise’s house and organized the shoes. When forming the nonprofit, Ruggio said they found that sometimes used shoes are donated, but many used shoes are thrown away. Parise who also has an interest in recycling and repurposing found that Nike will take used shoes and recycle them into different track surfaces, gym flooring tiles, and playground surfacing. Each month, Parise drops shoes that do not have a match or shoes that are too damaged at the Nike Outlet. “Every shoe gets a home,” she said. Jolly Old Shoes collects new and used shoes, shoe laces and gift cards to stores that sell shoes and shoe supplies. Many of the shoes are dropped off at Parise’s house or picked up by Parise herself. The organization also accepts monetary donations to help pay for shipping shoes. Individuals interested in making donations should contact Dr. Phyllis Parise at (630) 456-2348, pparise@sbcglobal.net or www.jollyoldsoles.com.